We offer affordable exhibitions to museums and university art galleries, generated from Syracuse University’s encyclopedic art collection and collaborating institutions. Visit the TRAVEX website to see our complete list of available exhibitions. 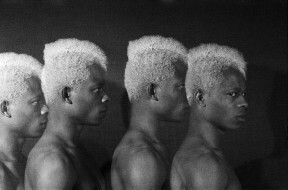 Rotimi Fani-Kayode (1955-1989) is a solo retrospective of the work of this seminal and highly influential figure in 1980s black British and African contemporary art. Although his career was cut short by his untimely death at the age of 34, Fani-Kayode nonetheless remains one of the most significant names in the history of black photography. This exhibition was organized by Light Work, in partnership with Autograph ABP. Curated in collaboration with Mark Sealy and Renée Mussai of Autograph ABP, whose co-founder and first Chair was Rotimi Fani-Kayode, the exhibition features a selection of his most important photographic works produced between 1985-1989, including large-scale color works and arresting black and white images.